I'm holding my breath on actually seeing her wedding dress, so until we do, this will have to do. Blake Lively's ridiculous and amazing Lorraine Schwartz wedding rings were on display last week and I think I've fallen in love. I. CANT. WAIT. TO. SEE. HER. DRESSSSSS. The rings are amazing. AMAZING. I DIED when I saw the pic and tweeted about that ring. HOLY HELL! I am on pins and needles waiting to see her dress. She always looks SO incredible!! ugh. it is freaking FABULOUS! 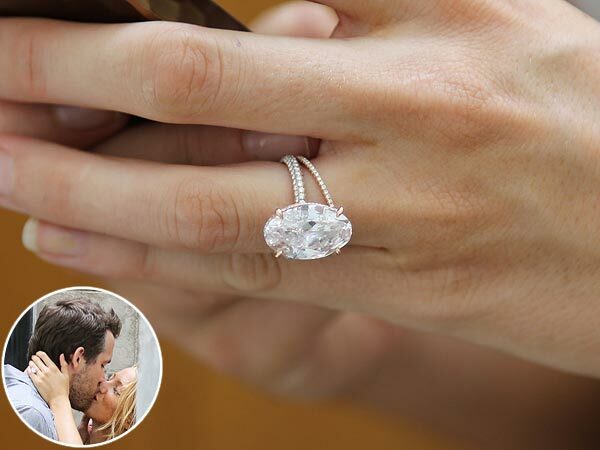 One of my favorite celeb rings yet! Very nice catch, I mean ring. Wow! I still can't believe they are married! But I am so ready to see that dress. I was surprised that they already got married, but they make such a cute couple! And oh my gosh, that ring is fabulous!